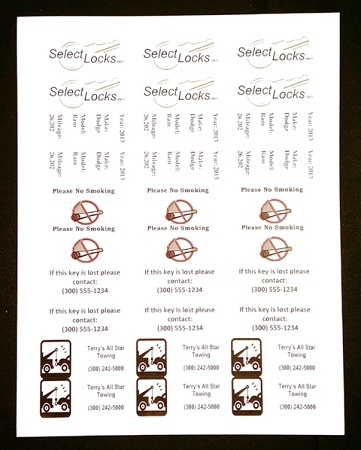 Additional labels for the 2 1/4" key tags (Part Number 30-00200). The labels are designed to be printed with Microsoft Word. These tags come on 8 1/2" x 11" sheets, 40 labels per sheet (4 across by 10 down). They are available in packages of 5, 10 or 25 sheets. The Microsoft Word template for these inserts is available for DOWNLOAD.